I like to get excited about space. Google can vouch for me: I have a gold Google News badge for reading 4 times as many articles about space than the average reader. It’s just an internet badge, though, nothing I get to wear proudly pinned to a sash like a Girl Scout. Yet. If only I was better at math, I’d have aimed myself at astronomy, because there are so many amazingly awesome things in space. And for once, I don’t mean “awesome” as in “totally rad”. I mean to say that space inspires awe. Mouth-hanging-open, mind-totally-blown, world-slowing-down awe. Can anyone look up into a starry sky and not feel like a tiny speck in a huge universe? Between Cosmos, Star Trek, NOVA, and televised Space Shuttle launches, a love of space was planted and nurtured in me well before I was out of elementary school. If I could have gotten away with it, I would have done every project, in every class, about Mars. That little black dot on the top right is Venus. See how tiny it looks? Now here’s the best part: it’s still about 70 million miles from the sun! If it was right up against the sun, it would be too small to make out at all (not to mention completely incinerated). You can imagine that if you hollowed out the sun and started filling it with Venuses, it could very well take a million or more. And we live on a planet that’s about the same size as Venus. In little tiny houses with little tiny yards where we can stand outside with little tiny telescopes and watch Venus travel across the sun, making us feel both completely insignificant and profoundly connected to it all. I don’t have a telescope, because I’ve always lived too close to big cities to make stargazing worthwhile, and because good telescopes are pretty expensive. 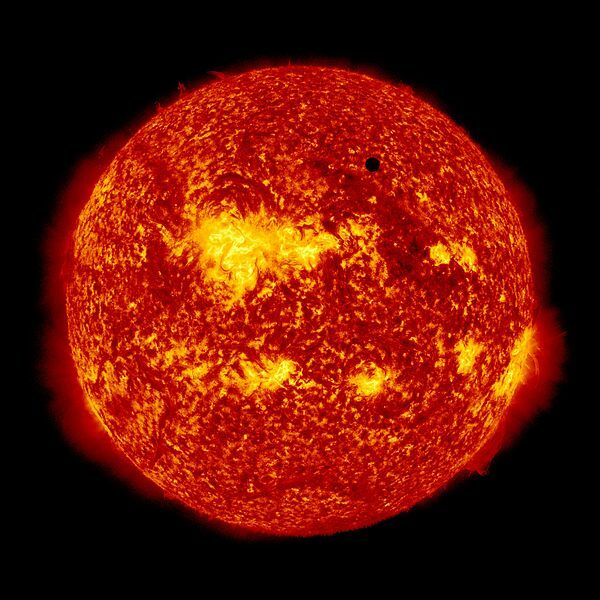 So the best way for me to enjoy the transit of Venus across the sun was to find live pictures online. Someone posted a link on Facebook to a live Google+ “hangout” featuring Phil Plait (The Bad Astronomer) and other space nerds, and hearing those guys get giddy and excited about what they were seeing, made me need to try and see something outside. The sun was setting, and it was mostly cloudy, but I saw some rays poking through the clouds and figured it was worth a shot. Obviously, staring into the sun is horrible for your retinas, so in order to see the transit safely, I rushed to make a pinhole camera. So there I was, standing in my front yard with my back to the sun, one eye squinted shut and a tin-foiled Cheerios box held up to the other, while neighbors walked their dogs past me and wondered why I was peering so intently into my cereal. If I’d been able to see anything, I would have invited them to have a look, but the image of the sun was too small for me to make out the tiny speck of Venus. I’d make a better viewer for next time, using binoculars and a filter, but the next transit of Venus isn’t until 2117. The best I’ll be able to do is convince my eventual grandkids that they should look up. This entry was posted in Uncategorized on June 9, 2012 by antijen. I agree, space is awesome. Love your enthusiasm. Google Sky is one of my favorite Android apps. You just point your phone anywhere, and it tells you what’s directly in front of you: stars, planets, everything in space. Want to know what that constellation is? BOOM! Just point your phone at it. It’s great for long, boring car rides. 🙂 Visiting from WOE link-up. Happy Holidays! I really need to get that app!